Via artist rendering, this screenshot from the transit plan shows Murfreesboro Pike — before and after. Before going into the nuts and bolts of the financing, it’s important to unpack one of the plan’s key concepts. The buzzword used by officials is “dedicated funding” for transit. What this means is raising taxes and securing financing to go solely into expanded transit, in essence creating a new pot of money to fund the Metro Transit Authority, separate from other Metro departments. This would be a big change, and it’s an arrangement newly made possible in Tennessee following action last year by the state legislature. As part of the IMPROVE Act, Nashville and other city and county leaders offered support for a statewide increase to the gas tax — which funds billions of dollars in road projects — and in exchange, successfully fought for authorization to raise six types of taxes for transit. (Nashville’s proposal then selected four of those six types: sales tax, business tax, hotel occupancy tax and rental car tax, as detailed on plan page 39). Metro officials argue it’s past time for Nashville to create a funding stream for transit, especially with the regional population growth that’s expected. Whatever the perspective, the referendum does ask permission to make a fundamental shift for Nashville: Should the city collect more taxes specifically for a much larger transit system? The plan calls for a combination of funding sources through 2032. The largest would be revenue from the four local tax increases (38%). The most robust money-generator, by far, is the sales tax, which is projected to eventually bring in more than $300 million per year, solely for transit. The next-largest share would come from borrowing, as Metro would issue $3 billion in bonds, to be paid back by 2060. Much more on those below. The federal portions have drawn questions, especially as to whether they would be guaranteed. In terms of the federal TIFIA loan that Metro wants, a city memo shows that Nashville could qualify for a loan of $1.8 billion, but intends to seek just $500 million (this is slightly above the average TIFIA loan of $394 million). For the federal grants — the New Start and Small Start programs — Metro’s plan seeks less than the maximum obtained by other cities. A city memo reports that 68 transit agencies have received these grants since 2009, that the available federal funding has increased in the past decade and that Metro's transit ridership projections would likely score well when applying. 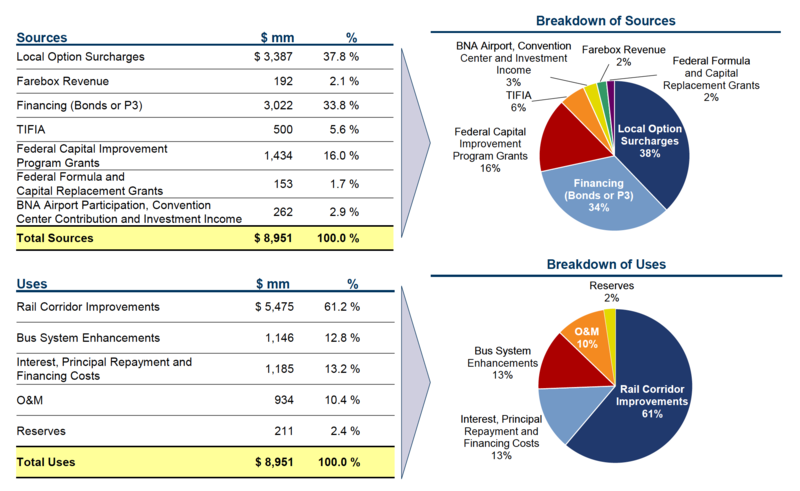 This chart from Nashville's plan shows the proposed revenue sources for transit, and how the money would be spent. To fund the entire plan — the bus improvements, new light rail lines, sidewalks, new fleet, changes to the roadways and bridges, and operating the system for 15 years — comes with a price tag of $8.9 billion. The largest cost would be light rail ($5.4 billion). After that, the next two largest categories are bus system enhancements ($1.15 billion) and, to the surprise of some, the financing costs ($1.19 billion). Exact figures have not been calculated beyond the first 15 years, when operations and debt repayments would be ongoing. The long-term financing plan, especially the amount of borrowing, has drawn concerns. One of the most vocal critics is at-large Metro Councilman John Cooper, who argues that $3 billion is too much to borrow, and that it’s risky to chart out a repayment schedule that takes decades. The bond repayment plan begins with 15 years of payments solely on interest — so the paying down of the principal amount is “backloaded” from 2032 to 2060. According to Councilman Bob Mendes, based on council briefings, Metro would end up paying down $226 million in principal per year for the final 20 years of the plan. Metro defends this amount of backloading. Riebeling — who agrees that it’s not ideal to begin with interest-only loan payments — said that’s necessary for this set of transit projects. He said Metro will need substantial funding to operate the expanding bus system while the rail lines are under construction, an arrangement that differs from building something like a stadium, which would not be in use during construction. This is another discussion in which dedicated funding surfaces. Metro is confident that the revenue will be robust from the four increased taxes, so would issue what are known as “revenue bonds,” which are specifically backed by those tax streams, and not the city's general fund. This setup is intended to separate transit from the city’s other debt obligations. “The whole idea of dedicated funding is the city’s transit system is going to be self-sustainable,” Riebeling said. Cooper still balks at the arrangement and said he also would have liked to see more state and federal grants involved, which wouldn't add to the debt load. “We are borrowing it, where we do have to pay it back,” he said. And the councilman doesn’t trust the tax revenue and cost projections that underpin the plan. To the councilman, either a misfire on tax revenues or construction cost overruns could jeopardize the plan. On this front, he’s starkly at odds with Riebeling and the authors of the plan. “We’ve been really conservative in our assumptions and have thought about a lot of these things,” Riebeling said. He points to the tax revenue projections as coming from a trusted economist from the University of Tennessee, and points out that the all-important sales tax projection is based on many years’ worth of data, including the recession years (read the projections and methodology here). This table shows the UT tax forecast for Davidson County, completed in advance of Nashville's transit proposal. Ultimately, the sales tax and hotel tax included in this table were factored into the city's plan. Metro also argues that other cautions are baked in, such as a contingency padding of almost 30 percent on construction costs, as well as other reserves (plan pages 29, 31 and 36). And while many cities have gone over budget on transit projects, officials say Metro actually benefits by learning from others’ mistakes. In particular, the construction cost estimates in Nashville’s plan were based in part on what other cities ended up spending. “With the reasonableness of this plan, the citizens should feel they have some protection,” Riebeling said. Despite Metro’s confidence, there's always a chance that it could run into trouble. And if that happens, WPLN listeners have asked whether another tax increase could be proposed. Riebeling and Hafkenschiel said that won’t be an option: that there wouldn’t be another tax increase, later, for transit. However, if things are financially rocky, Metro could be forced to alter its plan. That’s not particularly easy, as any substantial revisions to the list of transit projects could trigger another referendum. Metro doesn’t anticipate such a drastic departure, but other adjustments would be possible to keep the plan moving. First, Metro could look to adjust the mix of financing options, such as seeking more federal funds. Another step, if money is coming in slower than expected, would be to extend the timeline for the projects. At the center of Nashville’s transit proposal is an increase to four taxes. And the largest — in terms of how much money could be raised, and how many people would pay more — would be a higher local sales tax.